The East Whittier City School District has adopted a policy of open enrollment. If you live within the district boundaries and would like to request a different school for the 2019-2020 you must do so during the open enrollment period to be included in the lottery. The open enrollment period begins on February 12, 2019, and ends February 22, 2019. You can pick up a permit application at the District Office beginning that week. 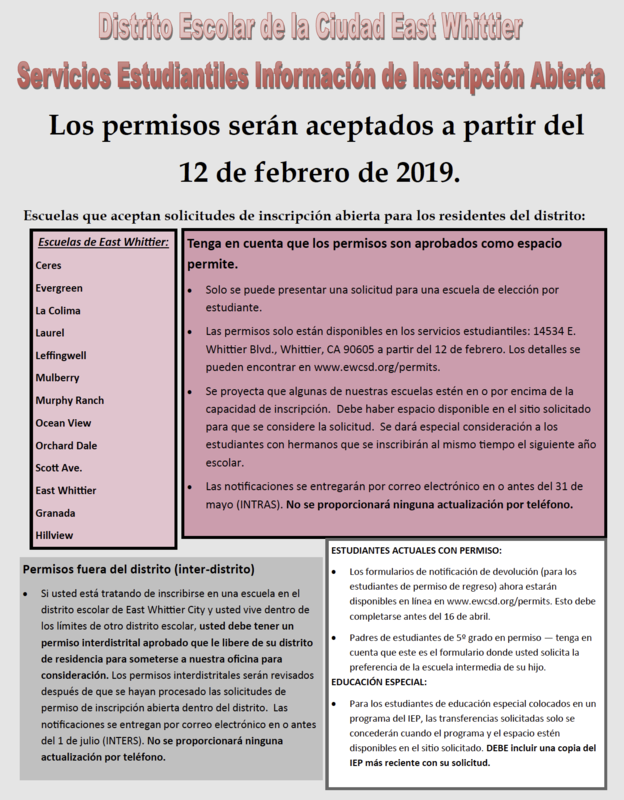 If you are seeking to enroll in a school in the East Whittier City School District and you live within another school district’s boundaries, you must have an approved interdistrict permit release from your district of residence to submit to EWCSD. We begin accepting interdistrict permits on February 12, 2019. This form is for students currently on permit. The notification of return is now completed online and must be submitted by April 16, 2019 for (within district permits) and May 16th for (out of district permits). *Please note that this is the form where current 5th-grade students on permit list the middle school of preference. *Failure to submit the NOR by the deadline date may result in losing your student’s spot for the following school year. Q: Who should participate in the Open Enrollment program? A: Only those families who live in the East Whittier City School District attendance area, and wish to have their child enroll in a district school other than his/her school of residence, should participate in Open Enrollment. Q: How do I determine my son's/daughter's school of residence? A: Students can determine their school of residence by going to www.ewcsd.org under the heading of Resources and clicking on Attendance Maps. Q: How do I participate in the open enrollment option for my son/daughter? A: Complete a permit application from the East Whittier City School District permit office during the open enrollment period. The permit office is located at 14535 E. Whittier Blvd. Whittier. The permit office hours are Monday through Friday, 7:30 a.m. to 4:00 p.m.
Q: Am I guaranteed the school I request during open enrollment? A: No. Some of our schools are projected to be at or above enrollment capacity*. If requests for a school during the open enrollment period exceed the school's capacity, permits for the schools listed will be accepted based on a random lottery. You will be notified in May if your child's permit has been accepted as part of the lottery process. Otherwise, your permit will be processed as an intradistrict permit and accepted based on the date it was submitted and the priorities for acceptance as indicated in Board Policy. Q: If I want my son/daughter to attend the same school as a sibling, and it is not the school of residence, do I submit an Open Enrollment application? A: Yes. You need to complete an intradistrict permit application during the open enrollment window. Q: We reside outside of the district boundaries but want our child to attend an EWCSD school, how do I do that? A: You will need to apply for an interdistrict permit. This requires you to get released from your child's district/school of residence. 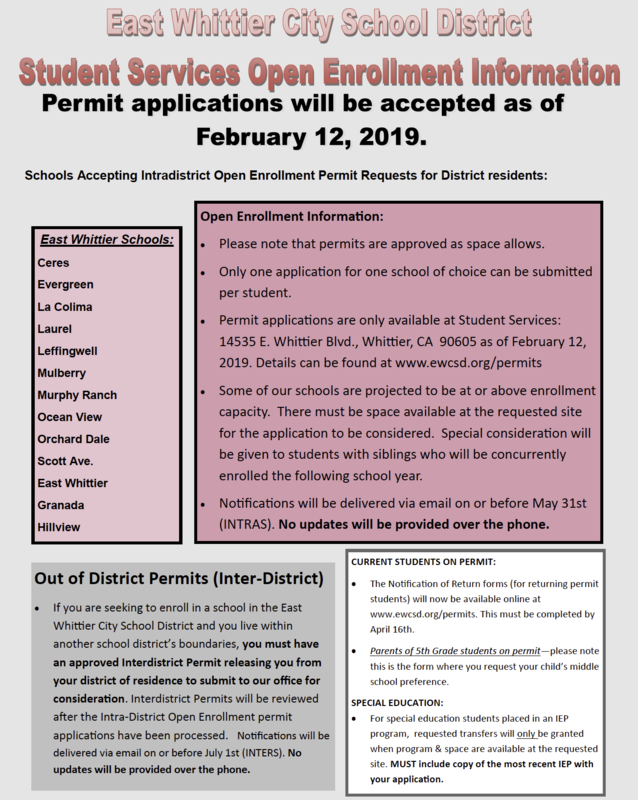 Once approved and signed by your district/school of residence you will need to submit that permit paperwork to EWCSD for consideration. Interdistrict permits are processed after open enrollment ends and are subject to available space. Q: Is transportation provided to the new school? A: No. Transportation is the responsibility of the parents/guardians. Q: Do open enrollment permits need to be renewed each year? A: No, however, you need to submit a Notification of Return form online each year. This year's deadline dates are April 16th for intradistrict permits and May 16th for interdistrict permits. Q: How do I register for transitional kindergarten? A: Please visit www.ewcsd.org/enroll for information about transitional kindergarten. Please use the form below if you want to be released from EWCSD to attend a school in another district. Complete and return form to lrosales@ewcsd.org. If you have any questions please email Lorraine Rosales at lrosales@ewcsd.org.